The Great Lakes Are Facing One of Their Most Serious Threats to Date ! PLEASE SIGN ! ! Thank you for submitting a letter asking the governments of Ontario and Canada to encourage strong and immediate action from U.S. officials to stop the Asian carp invasion. Thank you for submitting a letter asking the governments of Ontario and Canada to encourage strong and immediate action from U.S. officials to stop the Asian carp invasion. It�s the health of the Great Lakes that is at stake. Thank you for submitting a letter asking the governments of Ontario and Canada to encourage strong and immediate action from U.S. officials to stop the Asian carp invasion. It�s the health of the Great Lakes that is at stake. I was able to sign 3 total petitions on the same site. Shared too. Noted & Signed ! Thanks. Letter sent. Noted. Thanks, Cher. Signed & Noted , Thanks Cher. 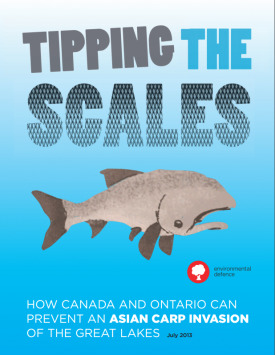 The Great Lakes need our help to prevent the invasive Asian Carp from destroying them. Noted, signed and commented. Thanks, Cher! Gladly signed and I hope that that the Asian carp invasion can be stopped. The ramifications of not stopping the carp will truly be disastrous to all. I live on Lake Ontario, and we have the Asian carps here for many years. Petition signed. signed. No longer live in Detroit, but still concerned about the health of the lakes. Noted and signed, with the comment that this threat is nothing new, but must be handled. Noted and signed, tweeted too. Thank you for submitting a letter asking the governments of Ontario and Canada to encourage strong and immediate action from U.S. officials to stop the Asian carp invasion. It�s the health of the Great Lakes that is at stake. S&N While a threat to tourism may not be high on the list of priorities and the ecological damage is more worrisome, I think it's a smart move to stress this. Governments usually only respond if the economy is compromised. We already have Asian Carp in the rivers. I have no idea what they can do about the problem, but here's hoping. Signed and noted!Taking anything out of it's environment to another where it will blossom to the disadvantage of the native wildlife is a recipe for disaster. We are desperately trying to save our smaller native red squirrel which used to be widespread but is nowonly found in the North of England and Scotland (and small pockets mainly on islands), due to a virus which the greys carry and the fact that they are bigger and outcompete the reds for food! It is easier to stop something early than try to remedy something when you are trying to hold back the tide! This is REALLY SCARY STUFF ! I hope those who can prevent this do not fiddle and fumble right up till we find our selves down the road existing in a hellish present...or should I say...even more hellish.